This high capacity battery replaces your L-Series NP-F970 camcorder name brand batteries. Utilizing the same footprint these units lock into place in the battery compartment. 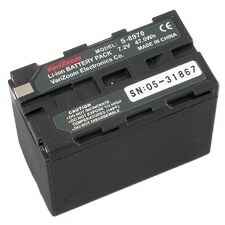 This high capacity battery replaces your Sony L-Series NP-F970 camcorder name brand batteries. Utilizing the same footprint these units lock into place in the battery compartment.